China and Japan: Toward a Xi-Abe Summit? A recent meeting in Beijing is a baby step toward a bilateral summit — provided historical issues don’t get in the way. On Thursday and Friday, China and Japan held their first high-level political talks since turning a new page on their relationship last November. Japan’s National Security Council chief, Shotaro Yachi, traveled to Beijing for talks with State Councilor Yang Jiechi as well as meetings with Chinese Premier Li Keqiang and Defense Minister Chang Wanquan. The talks raised hopes about a continuing thaw in China-Japan relations – including the possibility of a summit meeting between Japanese Prime Minister Shinzo Abe and Chinese President Xi Jinping. Japan’s Asahi Shimbun reported back in June that a planned Yang-Yachi meeting in mid-July would focus on two topics: Abe’s planned statement on the 70th anniversary of the end of World War II and a possible summit between the Chinese and Japanese leaders. Abe and Xi have meet several times since both assumed office, but always on the sidelines of larger multilateral groupings (most notably the APEC forum held in Beijing last November, and most recently at the Asian-African Conference held in Indonesia this April). A purely bilateral meeting between Asia’s two largest economies would be a major step forward. However, there are a number of obstacles to overcome first – not least the sensitive timing of this year, which marks the 70th anniversary of the end of World War II. That has focused even more attention than usual on the historical issues dividing China and Japan. Abe’s upcoming statement on the end of the war has become a flashpoint for these issues; the statement was believed to have been discussed during Yachi’s visit. Chinese officials have repeatedly emphasized (as Yang, Li, and Chang all did during their meetings with Yachi) that Japan must face up to the history of World War II. In the context of the Abe statement, that means issuing an unambiguous apology that incorporates language from the previous Murayama and Koizumi statements (made in 1995 and 2005, respectively). China (and South Korea) will look for Abe to follow his predecessors and acknowledge the damage done by Japan’s “colonial rule and aggression.” If Beijing is not satisfied with the statement, it could threaten the forward progress made since November 2014. Still, Abe is still considering a visit to China either before or after the parade, according to the Associated Press. The fall seems the most likely time for a hypothetical Xi-Abe summit, as both sides would have gotten their wartime remembrances over with. Historical issues were a major theme of the public comments released after each of the meetings. In his Friday meeting with Yachi, Premier Li spoke of the importance of the relationship for regional stability, but also emphasized China’s concerns over historical issues. 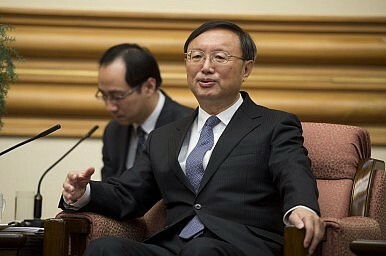 Yang Jiechi noted the same themes in the talks on Thursday. Still, both sides emphasized the need to carry forward as well as the obstacles. Both Li and Yachi noted the importance of increased exchanges (political, economic, and cultural) in rebuilding the relationship. Yang, meanwhile, called the bilateral meeting “a major move to enhance strategic communications of the two countries,” saying both sides had agreed to hold future “high-level political dialogues.” Talks between Yang and Yachi are particularly promising, as these high-ranking officials were responsible for hammering out the four-point consensus that allowed Xi and Abe’s November 2014 meeting to take place. Historical issues aside, China and Japan have competing and conflicting security interests in the region, from their mutual suspicion of military build-ups to their territorial dispute over the Senkaku/Diaoyu Islands. Those modern-day concerns, plus a mutual desire for repaired economic relations, would be at the top of the agenda of a Xi-Abe summit — if the two countries can overcome history to make it happen. Yang Jiechi's trip to Tokyo is a positive sign, but improvements in China-Japan relations still lack substance. At Long Last, a Xi-Abe Meeting. Now What?A China-Japan Breakthrough: A Primer on Their 4 Point ConsensusThe Politics of History in China-Japan RelationsShould the United States Be Blamed for Japan’s Historical Revisionism? The Abe Statement: Did Abe Apologize?